Acting Attorney General Matthew Whitaker is pushing back against political and media attacks that have dogged him since he took the top job at the Justice Department three months ago. Whitaker is scheduled to testify Friday before the House Judiciary Committee, which, like the House as a whole, is now controlled by Democrats. However, the Justice Department sent a letter Thursday to the committee’s chairman, Rep. Jerry Nadler, D-N.Y., saying Whitaker would appear only if Nadler agrees not to subpoena him for testimony he volunteered to give. Upon his being named acting attorney general Nov. 7, some Democrats sued to challenge Whitaker’s capacity to serve, while other Democrats charged he would run interference for President Donald Trump with special counsel Robert Mueller’s investigation. Whitaker told The Daily Signal that he hoped for a substantive hearing and noted that Democrats’ dire predictions and media warnings about his time running the Justice Department haven’t come to fruition. To have received some of that has been a little disheartening, but I said when I got appointed that even if I did it for one day, it would be worth it. Now that I have done it … no doubt I have enjoyed it and it has been worth it. After serving as chief of staff to Attorney General Jeff Sessions, Trump named Whitaker to an acting role, but nominated William Barr for the position long term. The Senate is expected to confirm Barr, at which point Whitaker said he is open to remaining in the Trump administration under some capacity. “I haven’t given up the thought of maybe doing something in the administration if the president thinks I can be helpful, but I’m also unafraid to go do something in the private sector,” Whitaker told The Daily Signal. Regarding his future, Whitaker declined to elaborate on whether he would like to continue serving the administration at the Justice Department or in another department. 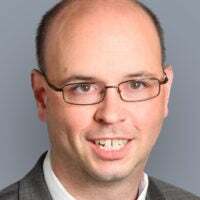 He previously worked for Justice as a U.S. attorney in Iowa during the George W. Bush administration, then as chief of staff for Sessions for more than a year during the Trump administration before taking on the acting role when the president fired Sessions on Nov. 7. 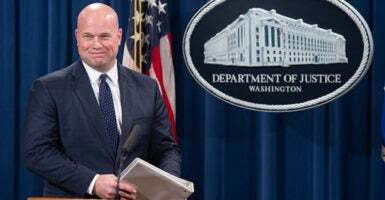 Whitaker, 49, said his main goal was to leave a “well-oiled machine” for Barr, expected to be confirmed next week by the full Senate following the Senate Judiciary Committee’s vote Thursday along party lines to advance him. Aside from that goal, Whitaker said, he hasn’t thought a lot about his next step. I could have never imagined that I would be in this position in the first place. So, I just think I just need to trust God, quite frankly, that sort of the next chapter of my life is going to be whatever his will is for my life. I think there’s going to be a lot of opportunities. In September 2017, Whitaker went to work for Sessions at a time of public tensions between Trump and his attorney general. As a result, Sessions sometimes sent Whitaker in his place for meetings at the White House. His time as chief of staff and acting attorney general saw major news stories about political intrigue in the Justice Department and the FBI. Whitaker remembers that most of his work with Sessions focused on big matters that didn’t get so many headlines, such as the department’s efforts in fighting violent crime, combating the opioid drug epidemic, and protecting national security. He said during the interview that he was disturbed by some of the media speculation. “General Sessions is the most decent man I’ve ever met, and it was just an honor of a lifetime to be his chief of staff,” Whitaker said. One day after the November 2018 election, White House chief of staff John Kelly called to inform Whitaker that he would be acting attorney general. “It was the honor of a lifetime, and it was a difficult day, as you can imagine, with everything going on,” Whitaker said. But Whitaker helped to defuse what could have been an uncertain time for Justice Department prosecutors across the country, recalled McGregor Scott, U.S. attorney for the Eastern District of California, based out of Sacramento. Whitaker said he had similar meetings with all of the assistant attorneys general and with the department’s senior leadership. Given the president’s public comments about his attorney general, Scott said, his ouster of Sessions was less of a surprise than the timing. Many Democrats and liberal pundits did not feel it would be OK, though, chiefly because Whitaker would supervise Mueller’s probe of Russian meddling in the 2016 presidential campaign. Whitaker’s scheduled appearance before the House Judiciary Committee is related to Democrats’ criticism of his oversight. In late 2018, Maryland Attorney General Brian Frosh, a Democrat, sued to challenge Whitaker’s appointment. Three Senate Democrats—Mazie Hirono of Hawaii, Richard Blumenthal of Connecticut, and Sheldon Whitehouse of Rhode Island—also sued. Both lawsuits argued that an acting official should be someone confirmed by the Senate. A review by the Justice Department’s Office of Legal Counsel, however, determined there was no issue in Whitaker’s serving, noting the temporary nature of his position. Whitaker said in the interview that he hoped for a substantive discussion with committee members on substantive topics such as “fentanyl overdoses” amid the opioid drug crisis, counterterrorism and cybersecurity, reauthorizing the Violence Against Women Act, and implementing the new law reforming the criminal justice system. Counterterrorism and counterespionage is something we can’t ever lose sight of. One of the things we’ve worked really hard on is Chinese economic espionage. I’d like to work with Congress to address these fundamental issues. I think there are bipartisan victim rights and victim compensation issues that we could work on. Whitaker spoke glowingly about the Justice Department, its prosecutors, and other law enforcement officials. However, many Republican members of Congress have pointed to the politicized, anti-Trump conduct of former FBI Director James Comey, former FBI Deputy Director Andrew McCabe, former FBI agent Peter Strzok, and former FBI lawyer Lisa Page, among others. All of these individuals either were fired or resigned in the past 20 months. The legal issues surrounding how FBI and Justice Department officials sought and obtained a warrant to surveil Trump campaign aide Carter Page is under investigation by U.S. Attorney John Huber of Utah, working with Justice Department Inspector General Michael Horowitz. Officials sought the warrant under the Foreign Intelligence Surveillance Act, or FISA, the law that allows government agencies to spy on Americans for cause, if approved by a federal judge in a secret national security hearing. The Huber investigation could be more broad, including issues related to how the Justice Department investigated the Clinton Foundation, as news reports have indicated. An inspector general such as Horowitz does not have prosecutorial authority, but Huber brings to his investigation the tools of a federal prosecutor, such as issuing a subpoena. Whitaker declined to speak on the matters under investigation in the Huber probe, but noted that several Justice Department officials were fired.